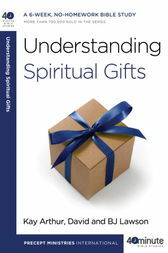 The subject of spiritual gifts can seem complicated: Who has spiritual gifts--""spiritual people" or everybody? What are spiritual gifts anyway? The 40-Minute Bible Studies series from the teaching team at Precept Ministries International tackles the topics that matter to you. These inductive study guides, designed to be completed in just six 40-minute lessons with no homework required, help you discover for yourself what God says and how it applies to your life today. With the leader’s notes and Bible passages included right in the book, each self-contained study is a powerful resource for personal growth and small-group discussion.